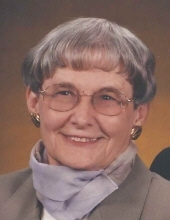 Jacquelyn “Jackie” F. Brown, age 87, Carthage, MO, passed away Monday evening, January 28, 2019 at St. Luke’s Nursing Center, Carthage. Jacquelyn F. Rollins was born October 7, 1931 in Carthage, MO, to the late Harry A. Rollins and Bessie Marie (Haughawout) Rollins. She was a 1949 graduate of Carthage High School, and then attended Joplin Jr. College, graduating in 1951. Jackie married Vern E. Brown on July 12, 1962 in Carthage, MO; he preceded her in death January 4, 2015. She was a homemaker and attended the First United Methodist Church in Carthage and Grace United Methodist Church in Perrysburg, OH. Survivors include three sons, Mark R. Brown (wife Sarah), Springboro, OH, David M. Brown (wife Jessica), Novato, CA, and Patrick L. Brown (wife Lee), Carthage, MO; four grandchildren and two great-grandchildren. She was preceded in death by her parents, her husband, Vern, two sisters, Harriett M. Williams and Dorothy W. Harrison, and one brother, E. Lynn Rollins. Memorial services will be held 10 am, Saturday, February 16, 2019 at Knell Mortuary, Carthage. Rev. James Lee and Minister J. Travis Brown will officiate. Inurnment will follow the service at Park Cemetery, Carthage. In lieu of flowers, the family suggests donations be made to the Alzheimer’s Association in care of Knell Mortuary. Online condolences may be expressed through www.knellmortuary.com. Arrangements are under the direction and personal care of Knell Mortuary. To send flowers or a remembrance gift to the family of Jacquelyn F. Brown, please visit our Tribute Store. In lieu of flowers, the family suggests donations be made to the Alzheimer’s Association in care of Knell Mortuary. "Email Address" would like to share the life celebration of Jacquelyn F. Brown. Click on the "link" to go to share a favorite memory or leave a condolence message for the family.